When a retired Lieutenant General of the Bundeswehr writes a dissertation entitled, "Die Bundeswehr als Instrument deutscher Außenpolitik" ("The Federal Armed Forces as an Instrument of German Foreign Policy" - published in German only ; order here on Amazon), people take notice and become curious about his new findings and the links between theory and practice. From general to academic. From obedience to the political leadership to an analysis of errors. The instruments of political science, mixed with the background knowledge of leadership positions in the Bundeswehr and NATO. Dr Ulf von Krause has written an excellent analysis, which was published this year by Springer VS Verlag. It is also a history of the Bundeswehr, from its tentative early years in the 1950's, through rearmament, to its deployment in Kosovo and Afghanistan and the reform of the armed forces. The General complains about the "political consideration of the prevailing mood in society, which limits combat strength and puts the soldiers in a difficult legal position". After two lost world wars, the bombing of German cities, the expulsion of 12 million Germans from the East, the excessive militarism and lust for war of the Nazis and later the militarisation of East German society by the communists combined with a direct confrontation in the Cold War, understandibly many Germans hold extreme reservations about the application of military force and are marked by a strong pacifist tendency. German-born Pentagon strategist Dr Fritz Kraemer called it the German "exclude me out" - mentality. Von Krause highlights one example: after nine years of engagement, some necessary military equipment for the German Forces in Afghanistan arrived only in 2010, because of the political restraint of the Federal Government. Furthermore, the rules of engagement were adjusted relatively late given the realities on the ground in the north of Afghanistan. The legal position of the German soldiers remained uncertain, because German criminal law, rather than the international laws of war, was applied to them. September 4, 2009 was a watershed. 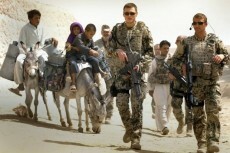 The Bundeswehr lost its innocence and politicians and the public were shocked by the consequences of combat operations. In this incident, the commanding Bundeswehr Colonel Georg Klein ordered the bombing of two tanker trucks that had been hijacked by the Taliban, only seven kilometers away from the German camp that night by the Kunduz River. More than 100 civilians who had been helping to empty the tanks were killed. From the air, they were not identifiable to the Colonel as civilians. Was the operation necessary for preventing a devastating attack against the camp? Could the civilians – and the Taliban – have been warned by a "show of force" low-level flight? Investigations by prosecutors led to the German officer being relieved. He lacked the necessary reconnaissance capabilities and long-range weapons. Only then were howitzers moved to Kunduz for such operations. The government now talked openly of a combat operation and war – words which they had till then avoided. Von Krause is right to criticize: "Politics is to blame for not having communicated to society their position, which has changed since 1999, on the use of military force as an instrument of policy." The political culture in Germany would need to change. Germany has been contributing more and more soldiers to missions overseas. The politicians gave them duties in Afghanistan (ca. 5000), Kosovo (3200), to guard the coast of Lebanon, and to defend against pirates at the Horn of Africa. Bundeswehr soldiers have also been deployed in Sudan, the Congo, Somalia and Mali. However, a broad discussion on the role of the armed forces and the strategic use of military assets is still lacking in Germany. The Bundeswehr is not situated in the middle of society, as in Great Britain, the United States or France. This also explains the reluctance towards other military operations, as in Libya or Syria. The main threat to the allies of NATO and the EU is not a strong and militarized Germany in the heart of Europe, but a weak and pacifistic one. Military expenditure is well below the threshold of two percent of gross domestic product. Even though a new, fresh and active NATO 3.0 peace and security polic is needed and a combination of effective defense capability and soft factors (see NATO 3.0 – Fresh new proposals by the World Security Network Foundation). General von Krause refers to the ongoing structural reform of the Bundeswehr, which provides for a reduction of the armed forces and an adaptation to international assignments. But this is a squaring of the circle. The schedule is dictated by budgetary constraints, not increased responsibilities in an order of world peace. The suspension of conscription was already found in "Model 4" of the Inspector General of the Bundeswehr from July 1st 2010 who suggessted 163,500 soldiers, of whom 10,000 should be deployed abroad. A reliable financial basis for the next six years would be required for this. Now the Bundeswehrreform (Federal Armed Forces Reform), which is currently being implemented, aims at 185,000 soldiers plus 55,000 civilian staff. The author rightly criticizes a complicated and error-prone organizational structure for the missions of the Bundeswehr, the separation of administrative and military force and the "delimitation" of military operations. His book is a laudable contribution and drills deeply into the thick braid of the military, bureaucracy and politics. It enhances understanding of German security politics and is a reminder to politicians to make the basis of armed conflict more meaningful and ultimately to also provide the Bundeswehr with sufficient funding. Germany has learned some lessons from its long engagement in The Balkans and Afghanistan. The coalition-negotiations between CDU/CSU and SPD about the new government agreed during last days to follow a combined approach of foreign, defense, and development elements in a joint strategy. Yet the funding is key - and vague.